Indian thought is sometimes deemed fatalistic, as holding that everything is destined by past karma, thereby leaving little room for human initiative. While Indian literature is filled with diverse thoughts – some of which may be fatalistic – the bhakti literature, which is among the most influential Indian literature, offer a far more nuanced and empowering outlook to life. The Ramayana features an emotionally intense and intellectually dense conversation about the interplay of destiny and human initiative. 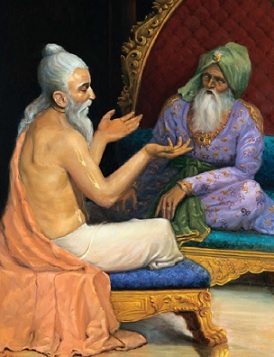 This conversation occurs at one of the epic’s defining moments: the moment when Rama, who was about to be crowned as prince regent, was instead sentenced to forest exile for fourteen years. While Rama gracefully accepted the exile as the will of destiny, his faithful younger brother Laksmana was outraged by the injustice and called for rebellion. Rama calmly responded that he considered His exile the will of destiny and so intended to accept it. He said that nothing else could explain how His stepmother Kaikeyi, who had loved him like her own son and whom he had served like his own mother, had suddenly become so malevolent towards him. Rama hadn’t done anything to offend Kaikeyi and certainly didn’t deserve to be exiled. Yet His exile was the boon that Kaikeyi had extorted from her husband, the monarch Dasaratha. Rama deemed obedience to his father his duty – a duty that he intended to follow unflinchingly. If some of us find Rama’s deference to destiny too docile, we may be intrigued to know that so did Laksmana. Rather than ascribe Rama’s exile to destiny, He sought to lay the blame on the human actors involved: Kaikeyi’s scheming and, more importantly, the king’s complicity. He alleged that the king had become infatuated with his beautiful wife and so had abandoned his duty to protect his own son. To Rama’s deference to destiny, the incensed Laksmana countered that only the impotent accepted injustice passively as the will of destiny; the strong fought injustice to protect their rights – and the kingdom was Rama’s right. Laksmana’s arguments may make us feel that His is an intriguingly modern voice railing against the fatalism prevailing in those times. Significantly, Rama was not fatalistic, as was evident from his dynamic response to other adversities such as the abduction of His wife Sita. He didn’t passively accept Her abduction as an act of destiny. When She was abducted, He had no guards, servants or royal resources for finding Her. He could well have seen His destitute condition as the arrangement of destiny, which conveyed thus that He should just passively accept Sita’s abduction. But the thought of such passivity didn’t even cross His mind. To the contrary, He always discharged His duty of protecting Her actively, even proactively. Throughout their stay in the forest, He always ensured that either He or His brother were at hand to protect Sita. And the moment He discovered that She was missing and found signs of a scuffle that pointed to Her abduction, He immediately started searching for Her. To rescue Her, He formed an unlikely alliance with monkey forces, marched hundreds of miles through difficult terrain and fought against a formidable foe who had bested even the gods. If Rama responded to Sita’s abdication so resourcefully, even forcefully, then why did He accept His own exile so passively? If He didn’t ascribe Sita’s abduction to destiny, why did He ascribe His own banishment to destiny? Because the defining decider of His responses was the consideration of not destiny, but duty. For Rama as a husband, the protection of His wife was His prime duty, and He didn’t even consider abandoning that duty in the name of destiny, no matter how difficult that duty was. For Rama as a son, obedience to His father was His prime duty – a duty He did even if it required renouncing His right to the kingdom. So the Ramayana’s message is not that we passively give in to destiny, but that we gallantly stick to duty. And if in the course of duty, some inconceivable calamity strikes, we can attribute it to destiny – and continue to do one’s duty. Throughout the bhakti literature, this subtle relationship between right, duty and destiny plays out fascinatingly. Let’s analyze events from two other jewels in the bhakti library: the Mahabharata and the srimad- Bhagavatam. The Mahabharata depicts and decries an attempt to abuse the concept of destiny for rationalizing one’s own passivity. Before the fratricidal Kuruksetra war, Vidura urges his brother, the blind Dhrtarastra, to correct his son, the evil Duryodhana. That stubborn prince refused to grant his cousins, the Pandavas, their due half of the kingdom. Vidura warned that Duryodhana’s obstinacy would cause the extermination of the entire Kuru dynasty. In response, Dhrtarastra invoked destiny to justify his passivity. He argued that if destiny willed that their dynasty be destroyed, who was he, a tiny mortal, to stop the workings of almighty destiny? Vidura responded by reminding the king that destiny determined the results of our actions, not our actions themselves. We all need to do our duty – that will bring auspiciousness in our life in all circumstances. If our destiny is favorable, then the auspiciousness will manifest immediately. If our destiny is unfavorable, then we will have to undergo some unavoidable reversals, but our dutifulness will create positive karmic credits that will shape a brighter future for us. An agrarian analogy can illumine this point. For farmers, plowing the field is the duty, whereas the occurrence of timely rains is destiny. Both are needed for a good harvest. Destiny determines whether the plowing will yield harvest, but it doesn’t determine whether the farmers plow or not. If they don’t plow, then even if the destiny is favorable, rains will cause the growth of weeds, no crops. Significantly, this understanding of the dynamics of duty and destiny is empowering: it offers impetus to do duty even when destiny is unfavorable. Though the farmers’ may get no harvest when destiny is unfavorable, still their diligent performance of duty will create positive karmic credits that will contribute to their positive future destiny. Thus, the execution of duty doesn’t go in vain, even when it doesn’t produce any result. So, the question Dhrtarastra prince refused to grant his cousins, the Pandavas, their due half of the kingdom. Vidura warned that Duryodhana’s obstinacy would cause the extermination of the entire Kuru dynasty. In response, Dhrtarastra invoked destiny to justify his passivity. He argued that if destiny willed that their dynasty be destroyed, who was he, a tiny mortal, to stop the workings of almighty destiny? Vidura responded by reminding the king that destiny determined the results of our actions, not our actions themselves. We all need to do our duty – that will bring auspiciousness in our life in all circumstances. If our destiny is favorable, then the auspiciousness will manifest immediately. If our destiny is unfavorable, then we will have to undergo some unavoidable reversals, but our dutifulness will create positive karmic credits that will shape a brighter future for us. An agrarian analogy can illumine this point. For farmers, plowing the field is the duty, whereas the occurrence of timely rains is destiny. Both are needed for a good harvest. Destiny determines whether the plowing will yield harvest, but it doesn’t determine whether the farmers plow or not. If they don’t plow, then even if the destiny is favorable, rains will cause the growth of weeds, no crops. Significantly, this understanding of the dynamics of duty and destiny is empowering: it offers impetus to do duty even when destiny is unfavorable. Though the farmers’ may get no harvest when destiny is unfavorable, still their diligent performance of duty will create positive karmic credits that will contribute to their positive future destiny. Thus, the execution of duty doesn’t go in vain, even when it doesn’t produce any result. So, the question Dhrtarastra should have asked was not whether the war was destined or not but whether he was doing his duty or not. As the king, it was his duty to ensure that justice was done for all his citizens, what to speak of his own nephews, what then to speak of nephews who were fatherless and for whom he was expected to act like a surrogate father. To let his son continue the atrocious exploitation of his nephews was a grievous dereliction of duty on Dhrtarastra’s part. Vidura rightly reproached his brother for not only abandoning his duty but also for falsely invoking destiny to whitewash such abandonment. A pastime from the devotional classic, srimad-Bhagavatam, depicts the right use of destiny in an argument. When Vasudeva and Devaki, who later became Krsna’s parents, got married, their wedding procession threatened to become a funeral procession. Devaki’s cousin brother Kamsa had been driving the chariot of the newly-weds. On hearing a celestial prophecy that Devaki’s eighth son will kill him, the benevolent-seeming Kamsa turned violent – he grabbed his sister by her hair and raised his sword to decapitate her. Vasudeva tried to check the vicious Kamsa by reasoning with him. One of the arguments he used centered on destiny: If destiny had decreed Kamsa’s death, then nothing, not even killing Devaki, would stop destiny from taking its course. Why then should Kamsa accrue bad karma by committing a triple sin: killing a woman, killing on a sacred occasion of marriage and killing his own sister? Vasudeva could well have turned the same argument of the inescapability of destined death to Devaki. He could have asked himself: If she was destined to die, why should I strive to prevent it? Why didn’t Vasudeva argue thus? Because his focus was not on destiny but on duty. It was his duty to protect his wife and he was going to do his best to protect her, while knowing that destiny would determine whether his effort would be successful or not. But destiny didn’t decide whether he would do his duty or not – that was in his hands and he did it resourcefully and fearlessly. duty but also for falsely invoking destiny to whitewash such abandonment. Kamsa, on the other hand was giving up his duty by attempting to assassinate his sister. So Vasudeva reminded him about destiny to get him back on the path of duty or to at least stop him from doing the very opposite of his duty – killing the very sister he was dutybound to protect. While the relationship between free will and destiny is complex, it can be summed in the broad principle: what happens to us is destiny, how we respond to it is our free will. And we can choose the best response by sticking to our duty, as given in scripture and guided by the bhakti tradition. Consider, as an analogy, a card game: Destiny decides the hand we get, while a sense of dutifulness guides us to the best use of that hand. Claiming that there’s no such thing as destiny is like claiming that we have full control over the hand we get – patently untrue. In the game of life, we all get different hands; we are all born with different sets of talents and resources and throughout our life we face different challenges based on our individual situations. For Rama as an obedient son, His duty was to serve His father. He would normally have done so by accepting the post of prince regent and eventually of the king. But when extraordinary circumstances conspired to have Him banished, He stuck to His duty, albeit in a drastically different form – not as a prince, but as an ascetic. And He attributed those extraordinary circumstances to destiny; inconceivable, inexorable destiny had moved His stepmother to express such uncharacteristic greed for power. Rama rejected Laksmana’s call for rebellion not because He was fatalistic and effeminate, but because He was resourceful and courageous enough to do His duty even when it was exceptionally difficult. To Laksmana’s charge about the king’s motivation, Rama pointed out that their father had acted not because of infatuation but because of obligation: he had long ago promised Kaikeyi two boons and was honor-bound to grant them, even when doing so caused him heartbreaking agony. Rama stressed that the king’s readiness to do so demonstrated not his weakness but his truthfulness. Rama’s refusal to seize His right to the kingdom by sacrificing His responsibility as a son is instructive. Though something may be our right, it may not always be right for us to claim it. Considerations of our rights need to be balanced with deliberations on our responsibilities. We live in a culture that frequently champions rights and downplays responsibilities. Parents often find it extremely difficult to raise children who feel that they are entitled to lots of things without feeling that they need to do anything to get them. John F. Kennedy’s exhortation, “Ask not what your country can do for you – ask what you can do for your country,” was a call to shift the focus from rights to responsibilities. Such a shift comes much easier when we have a spiritual conception of life, when we understand ourselves to be souls and see life from a multi-life perspective wherein results for dutifulness are guaranteed, but not always in this life. When we are faced with problems, we can deal with them better if we approach them with a positive attitude, focusing, for example, on how the glass is half-full, not half-empty. 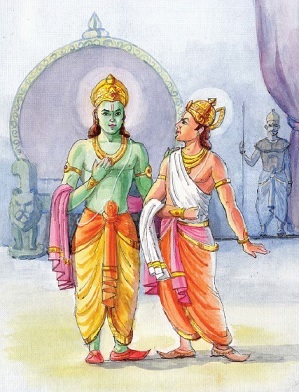 Illustrating how spiritual wisdom engenders positive outlook, Rama responds to his banishment by stating that He doesn’t see any cause for distress: He has the satisfaction of ensuring that His father’s word is honored; He has the joy of facilitating the enthronement of His younger brother, who was like a son to him; and He has the opportunity for spiritual growth by the association of sages in the forest, an opportunity that He would otherwise have got only towards the end of His life when He retired to the forest. Thus, Rama’s spiritual vision grants Him extraordinary positivity. He accepts the adversity of banishment not with handwringing and teeth-grinding, but with dignity and determination, looking to make the best of the situation. That Rama ascribed the adversity that befell him to destiny is significant because He is God himself – He is the Lord of destiny. If He wanted, He could have changed destiny – something we can’t do. But He had descended as an avatara to demonstrate the life of an ideal human being, and He did so by exemplifying how to respond to adversity with maturity. If we focus too much on our rights, we may end up beating our head against a wall, trying in vain to get things which we think are our right but which have been taken away by unchangeable circumstances – by the will of destiny. On the other hand, if we focus too much on destiny, we may end up doing nothing at all, thereby depriving ourselves of our authentic rights and letting the world walk all over us. Acceptance of destiny is not a recipe for sentencing oneself to weakness and helplessness; it is the pathway for the most constructive channeling of our energies. The sense of dutifulness can help us in our spiritual life too. In our devotional practices, if we focus too much on our rights – especially if we imagine and expect that higher spiritual happiness is our right because we are practicing bhakti-yoga – then, during the dry phases of our spiritual life, we will sentence ourselves to dissatisfaction and doubt, worrying unnecessarily whether bhakti works or not. By cultivating dutifulness, we can practice bhakti steadily till we eventually relish the higher happiness that comes from purification and the mercy of the Lord, who is pleased by our selflessness. To conclude, the bhakti literatures teach not fatalism but pragmatism: the sound practical intelligence that refuses to buy the lie that everything is in our control. By remembering that there is much we cannot control, pragmatism urges us to focus our energy on those things that we can control. Nowadays many people suffer from depression, inferiority complex and suicidal urges. A major reason for such psychological problems is an underlying misconception about controllership: they are led to believe that they can control everything and when they can’t control things, they think that something is intrinsically wrong with them and they sink into self-flagellating thought patterns. That’s why a proper understanding of destiny can be salutary; it can prevent dissipation of our energy in fruitless fantasies or lamentations, and can channelize it towards growth-inducing choices. Caitanya Carana Dasa is the associate-editor of Back to Godhead (US and Indian editions). To subscribe for his daily Bhagavad-gita reflections, please subscribe for Gitadaily on his website, thespiritualscientist.com.